Phuket and Koh Samui are two of the most famous and visited islands in the whole of Thailand. They are known for their beauty and tourist attractions and are definitely well worth the visit. Although both beautiful, they’re both unique in style and personality. So if you’re stretched for time and can only visit one, read on to find out which island suits you best. As Phuket is the larger of the two islands, it’s accessibility outweighs that of Samui. Phuket can be accessed through land, sea and air, with its newly renovated international airport. Samui on the other hand cannot be accessed by land and it’s airport is privately owned which makes flights infrequent and pricier. 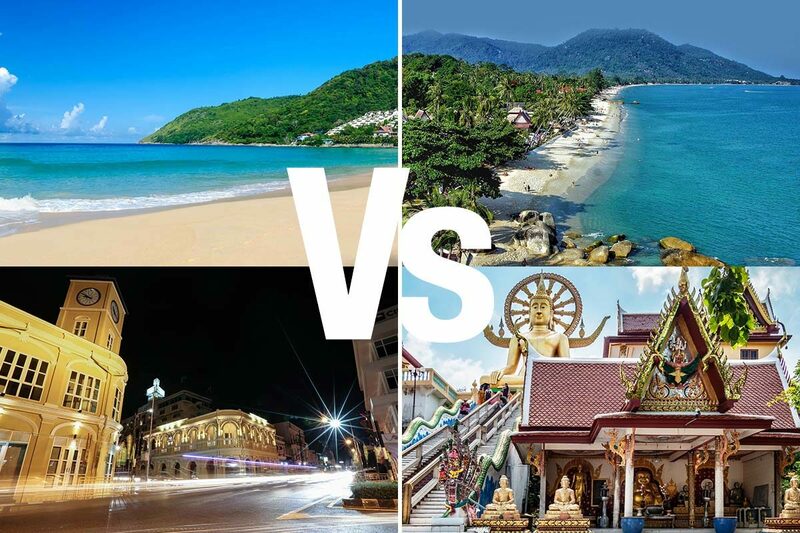 When it comes to the best beaches, both are spectacular in their own unique way. If you’re looking for something quiet and tranquil with views looking out onto the Gulf of Thailand, Samui is your answer. However if you prefer things to be busier with more options for activities such as surfing, watersports on the Andaman Sea and beach clubs, then Phuket is your place to be. As far as eating out in concerned, both islands offer world renowned food options with fine dining and michelin star restaurants. Both islands also have never ending streets of street food and casual cafes. In terms of western cafes and coffee culture, Phuket is up there as it is a larger island so the demand is greater. Naiharn in Phuket has become a hub for healthy western cafes and cute little coffee shops. As both islands are built for tourists, they are equally equipped with hotels and accommodation to suit all types of travelers. From backpackers to luxury travelers and everyone in between. Hostels, AirBnb, guest houses, luxury hotels and pool villas; you name it, they’ve got it. So if you’ve got a particular travelling style, read before you travel and pick the island that’s right for you!